Hassey | Do Duy is a complete dental practice able to restore smiles with a variety of dental solutions, including dentures and partial dentures. Dentures are removable prosthetic dental appliances that are used to replace missing teeth. Made of acrylic, dentures snap or adhere into place and allow a patient to talk, eat, and smile comfortably. There are generally two types of dentures that Hassey | Do Duy prescribes our patients who are affected by missing teeth. 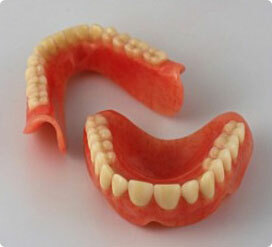 Partial dentures may be recommended for patients who have several missing teeth, located in the same vicinity. Requiring a metal framework to securely fasten them into place, partial dentures still allow a patient to remove them for proper cleaning and maintenance. Full dentures are often used to replace an entire row of missing teeth, either in the upper tooth line or the lower tooth line. Created from an impression of a patient’s mouth, full dentures are removable devices that are made to look and feel like natural teeth. Dr. Hassey and Dr. Do Duy will carefully determine which restorative device is right for each patient’s unique needs. We’d be happy to meet you and discuss the variety of denture solutions we offer in Methuen MA. Contact our office today to schedule your appointment!